Garden hoses are a mess for recycling plant operators because they are long stringy items that damage equipment. They also create safety hazards for employees, so remember to place in the trash. Polyurethane or natural rubber hoses are better alternatives to PVC hoses, so check the label. In general, they are more eco-friendly because they do not contain chemicals that can leach into the environment. One of the easiest ways to reuse an old garden hose is to poke holes in it and use it as a drip watering or irrigation system. Slit open a piece of garden hose and use it as a blade protector for a saw, ax or even your ice skates. 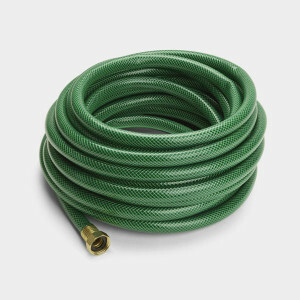 A study on over 100 garden hoses found that many contain unsafe levels of BPA, lead and flame retardants, all of which leach into the water. Drinking from garden hoses can be hazardous to your health. Read more about this issue in an article by Time.